PDP says APC is a sinking part trying to destroy Nigeria’s democracy. The Peoples Democratic Party, PDP, has dismissed as false alarm, the statement by the All Progressives Congress, APC, that federal lawmakers were being bribed millions of dollars to defect to the ruling party. The APC issued a statement on Tuesday claiming that the PDP had rolled out an enticement package that promised $2 million (N328 million) to each Senator who returns to the PDP; $1 million (N164 million) to a member of the House of Representatives, and $10 million (N1.64 billion) to a “leader” who abandons the APC for PDP. It claimed that the price tag for the federal legislators from Rivers State was even higher – $5 million (N821 million) each. 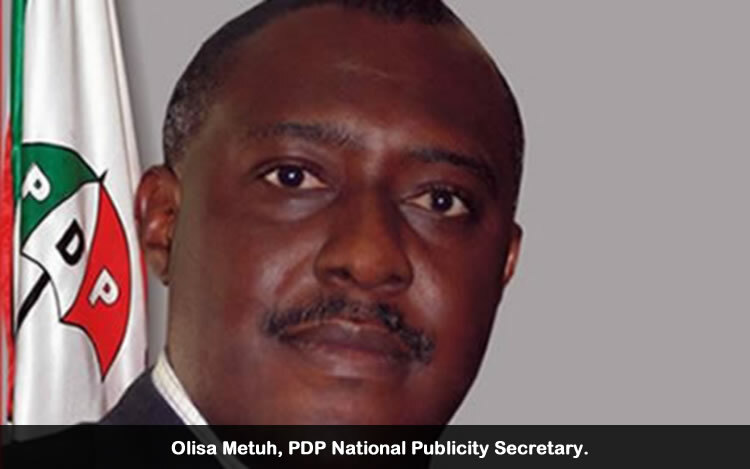 The PDP spokesperson, Olisa Metuh, said the APC was making spurious claims. He said the party “should ordinarily not dignify this sinking party (APC), notorious for lies, deceit and propaganda with a reply, we are compelled to do so because their action is a direct attack on the basic fabric of our democracy”. PDP claimed that the APC’s statements and actions are aimed at destroying Nigeria’s democracy and that all well meaning Nigerians are worried. “In alleging that lawmakers were being financially induced, the APC seeks to cast doubt in the minds of Nigerians regarding the integrity of duly elected persons, politicians and the entire democratic institution,” Mr. Metuh said in the statement. The ruling party urged the National Assembly to insist that the APC withdraws the allegation and apologizes to the legislature and the entire nation. “The truth is that the APC has reached its peak. Diminishing returns has set in and the party can only go down further. It is a clear sign that it has exhausted all its strategies and now seeks to cover its premature boast of majority in the National Assembly. “The APC celebrated too early. They have played all their cards and displayed all their tactics well ahead of the contest. Theirs is a case of engaging in a marathon race as a sprint; a football team celebrating its mere appearance in the pitch far before the beginning of a match. Now, they are weary and tired while the contest is yet to begin,” the party said. Mr. Metuh said that the PDP under its new National Chairman, Adamu Muazu, is reaching out to all its members including those that defected in a reconciliation drive that is already yielding dividends. “We are not surprised about the flurry of defections and return to our fold. The PDP remains the only national party while the APC is quasi national. The PDP is owned equally by all its members irrespective of race and religion, the APC is owned by a tiny clique of civilian and civil-clothed dictators whose major agenda is to capture power for selfish ends and turn Nigeria to either old Sudan or Somalia. “We are expecting more defections to the PDP. We have consistently told Nigerians that the PDP would emerge from its challenges a stronger party and this is what we are witnessing,” he said.